George W. Bush vs. Obama approval ratings: Apples to oranges. Comparing George W. Bush’s “approval ratings” with President Obama’s pits nostalgia against reality. But there aren’t really “approval ratings” for George W. Bush. There was, in April, a Washington Post poll that asked voters whether, in retrospect, they “approve or disapprove of the way Bush handled his job as president.” And 47 percent said they approved, though much smaller numbers approved of his actual performance on foreign and domestic policy. That is marginally higher than Barack Obama’s current approval rating, but it’s an apples-pears comparison—one question is based in nostalgia; the other, contemporary performance. What other reporters (not Haberman) have occasionally done is conflate real-time poll numbers that don’t even gauge Bush’s job approval. Last month, taking a break from blog posts about how Republicans could win the Massachusetts special election, Jennifer Rubin noted a new Gallup poll that had 49 percent of Americans “viewing [Bush] favorably,” while “on the same day President Obama’s approval/disapproval margin was 47 to 44 percent.” But these are different measurements. One question asks whether voters simply like a person, and one asks how that person’s performing in office. Obama’s “favorable” number hangs around 50 percent, dipping as low as 47 percent (Fox News) and as high as 55 percent (Gallup). He continues to be better-liked than Bush, though during the NSA story the numbers have started to converge. Anyway, none of this seems to matter politically. 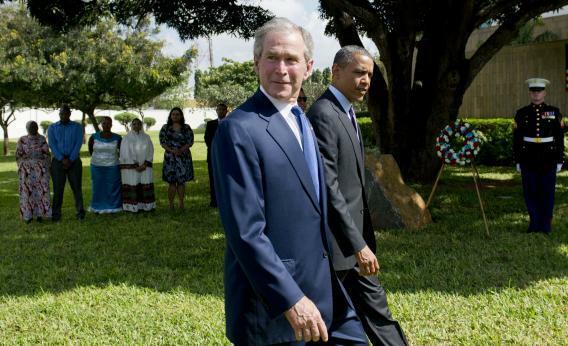 Republicans aren’t capitalizing on any affection or nostalgia for Bush. The former president’s short address on immigration today is having no impact on the current immigration debate. Republicans I talked to yesterday politely declined to say whether Bush’s support for a bill was helpful; I took this to mean that it wasn’t, really. Bush’s recovery from sub-30 percent poll numbers has been welcomed by Republicans as a tool for gloating, with no corresponding look at Bush’s policy preferences. It’s something to crow about on Fox News before going back into the conference meeting to kill immigration reform.